As prices for staple foods fluctuate seasonally, there is room for arbitrage by entrepeneurs. This project investigates potential barriers to arbitrage, such as missing credit markets, government policies, high costs, or entrepreneurial attitudes to develop policy insights into removing these barriers. Prices for staple foods play a fundamental role in the welfare of households in the developing world, directly influencing both consumption levels and production decisions for hundreds of millions of poor households. As a result, increasing the prices farmers receive for what they sell, and lowering prices consuming households pay for what they eat, are two commonly pursued – if sometimes contradictory – policy goals (World Bank 2008). Food price patterns in many parts of the developing world often tend to worsen this “food price dilemma”. For instance, staple grain prices throughout sub-Saharan Africa show large, regular seasonal fluctuations, falling precipitously in the post-harvest period and rising throughout the rest of the year as market supplies dwindle. These seasonal fluctuations represent a source of hardship for poor households but also a clear arbitrage opportunity for entrepreneurs, given that grain is inexpensively stored. Working in Western Kenya, an area where maize prices typically double within the season before plummeting after the next harvest, the researchers plan to explore why private sector maize trade is underdeveloped in this region of Africa. Though a nascent network of maize traders does exist in Western Kenya, they are too few in number or trading at too small a scale to be able to smooth the large price fluctuations that markets in the area continue to experience. 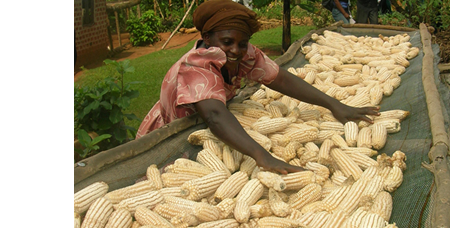 Through focus groups and detailed trader surveys, the authors plan to build a detailed descriptive picture of the maize value chain in order to better understand the cost structure of these traders’ small firms and investigate the barriers that prevent existing or potential grain traders from participating in arbitrage. This study will thus supply information on whether private sector development in maize trade is limited by missing markets (e.g. for credit), by existing government policies (e.g. trade policy), by high costs, or by entrepreneurial attitudes among candidate entrepreneurs. Each finding would have a distinct policy implication. For instance, findings could suggest high returns to investments in complementary financial tools (such as credit or insurance), could support large-scale investment in transportation infrastructure, or could suggest a re-think of specific government policies regulating within- and cross-border grain trade.